Why You Need This Part: Well it is time for an engine rebuild on your Honda CL360 Scrambler / CJ360 / CB360 and things are not looking good. Whether your cylinders are pitted from rust or the engine is just plain worn out, your engine will need its cylinders bored oversized. This means a fresh set of oversized pistons, rings, wrist pin and retaining clips finish your rebuild right. 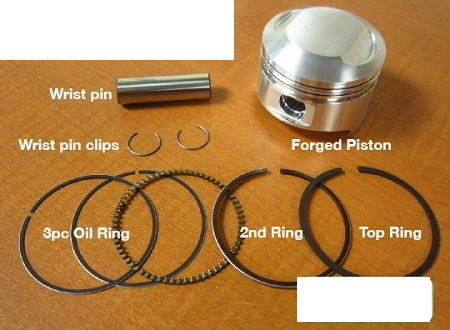 The problem is that original oversized pistons and their matching rings are pretty much extinct for the CL360 / CJ360 / CB360 family of bikes. Well the good news is not all is lost my friend. In fact we can rebuild your CB360 engine better than when it left the land of sushi. 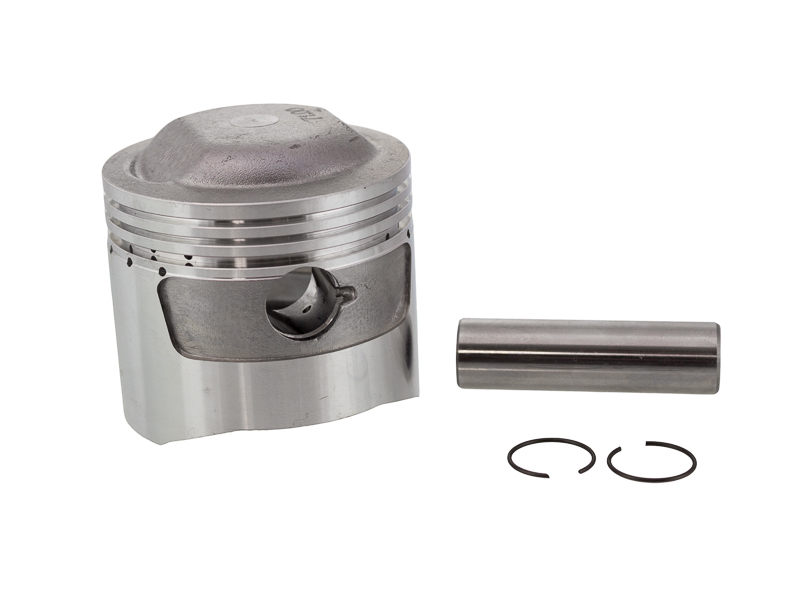 Our premium forged piston kits are a beautiful piece of machine work and are significantly stronger than the original stock cast pistons. 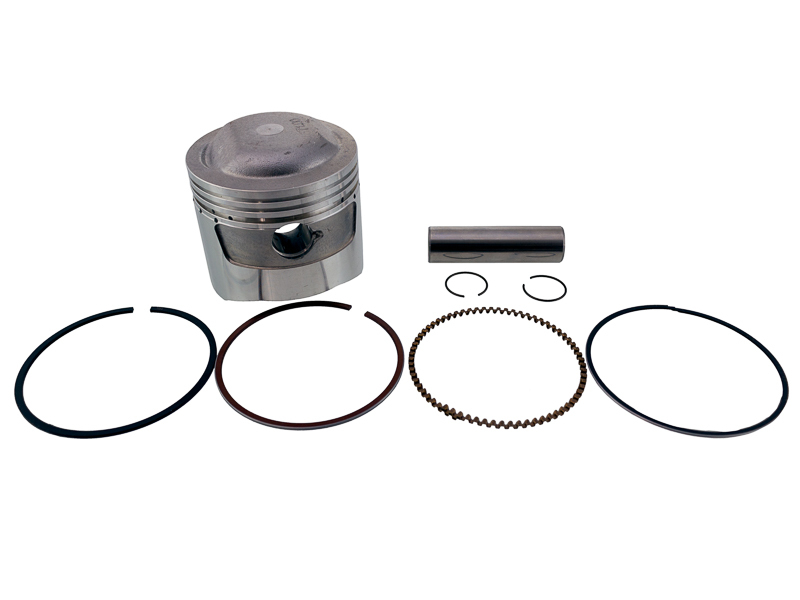 These high performance forged pistons are made in the USA with each kit including an oversized piston (.5mm or 1.00mm oversized), matching piston ring set, wrist pin and wrist pin retaining clips. Each piston kit is sold individually, two kits will be required per engine. The additional piston size will give you a few more CC's too, at 362cc (.5mm over) and 368cc (1.0mm over). Get the rebuild done right with our gasket kit, cam chain, oil seals and a new cam chain tensioner. Installation Tip: Cylinders must be machined to the correct size by an engine machine shop, which means you need pistons in hand when you drop it off. Wash freshly machined cylinders with hot water and dish detergent. Wipe cylinders clean with a white cloth, when the cloth shows no residue then cylinders are clean. Install pistons with arrow facing toward the front of the engine. Make sure to lubricate up the pistons and cylinders with engine oil before installation.